I am Gira. I come from a township in South Africa. I live togheter with my five siblings, mother and father. My mother works a lot. I almost never see her, and when I do she is so tired and never talks to me. I am the oldest of my brothers and sisters so I cook and clean when my mother is away. My father is hardly ever at home either. I always see him in the streets drinking with his friends. I try to avoid them because they always call me bad names and want me to sit down and have fun with them. I don´t like their jokes. I go to a public school. I used to have no friends there. My class is very crowded and noisy. We have one teacher and are almost 50 pupils, so I find it very hard to consentrate and enjoy myself. It is also hard because I have a lot of tasks at home, so I bring my concerns and my stress to the school. One day after school something special happened to me. I was tired and walked slowly back home when I suddenly heard some sounds. I looked around the corner and saw a big group of girls and boys my age who played instruments and danced with big smiles on their faces. One of the tutors saw me standing in the corner and waved at me. I got nervous because I thought I had done something wrong and should not be there, but the tutor kept on waving and smiling so I walked towards her. “Is it the first time you see a field band?” she asked me. “What do you think?”. “I love the sound of that instrument”, I replyed and pointed at a big instrument made out of wood with many wooden keys. The tutor asked me if I wanted to try. I could not stop smiling when I got to stand beside another girl and play together with her on the instrument. She told me it is called the marimba. “Next rehearsal will be on Friday”, the tutor said. ”Join us if you like. We are seeking for new members”. I ran all the way back home. Making the dinner that evening felt so much easier when I sang the melody of the marimba inside me. I could not wait for the next rehearsal with the field band. Now I have played in the field band for a while. I have got a lot of new friends. The tutor that first saw me gives me very nice challenges. I feel so proud when I manage them. She is also very nice to talk to. Once I told her how I feel about my father and his drunk friends. The tutor and the social worker in the band said I was smart and brave not to join them in the streets. They even said that they could come on a home visit. My father is not very happy about it, but my mother looks forward to it, and will make something nice for them when they come. The social worker is a very nice man and everyone respect him for his nice behavior. I think my father will do so too when he meets him. I hope you will continue to follow my experiences in and outside the field band here on this webpage. Gira – why and how? 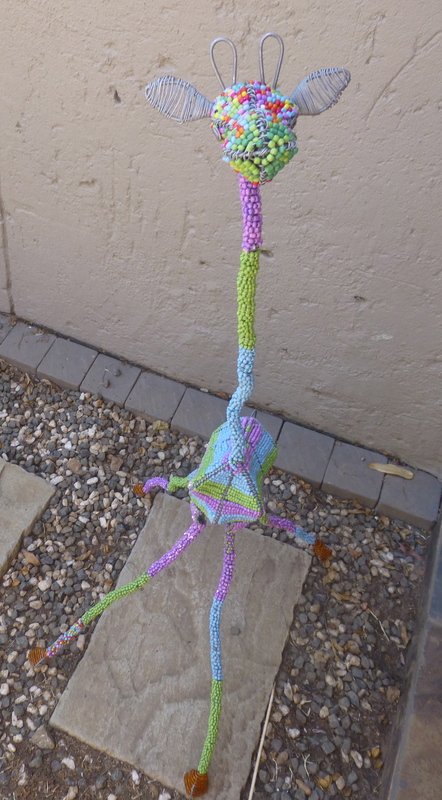 PULSE is using Gira, a toy giraffe, to share stories and get to know the everyday life and concerns for children and youth in townships in South Africa, focusing on members and staff in the Field Band Foundation. Gira is not a real person and can in that way not be a person that the kids might be attached to, but a figure with a story that some of the children can see themselves in. It can be easier to open up to a non-realistic figure, like toys, dolls, and teddy bears, than a real person. We will communicate, get to know, share stories and life skills topics to children and adults by using an informal language, pictures and movies through Gira. We use Gira in all the case stuides, interviews and home visits with the children, and bring her to all the Field Band rehearsals we attend. In our story about Gira we present her as a female with many concerns and a difficult family and school situation. But Gira can also be a boy, and any age – Gira can be anyone. Gira is often tired, stressed and sad and has few ways of expressing herself and relax. She has a lot of resposibility and few adults to talk to. Gira’s story can reflect many children in townships’ everyday life and challenges. By presenting Gira’s background the way we do, we hope she can be a representative for many children. By showing how Gira feels better when playing and expressing herself as well as getting a positive social belonging experience and adult support in the field band, she is a good example on how connection between music acitivies and health promotion is naturally linked. We will present Gira’s story to children, youth and adults. We hope that the stories that will be linked up to theories like resilience and post traumatic growth, can be used as a tool to document the positive outcomes of the Field Band Foundation’s work. For the adults working in and with the bands, Gira can also put an example on how theory, life skills etc. can easily be communicated through practical examples. – A friend that plays the marimba together with Gira. The friend represent the importance of social belonging and inclusion, and how a friendship can be made through common interests and doing something together. – A female tutor that immediately sees Gira and gives her challenges and positive feedback, and the feeling of mastering something. The tutor is also an imporant trustworthy adult Gira can talk to outside her home. – The social officer is a male and represent a role model for both girls and boys. We find it important that he as a male can be someone to trust and look up to for all genders. We also mention that the tutor and the social officer offers a home visit.